This article is intended to provide readers with a deeper understanding of how the capital raising process works and happens in the industry today. For more information on capital raising and different types of commitments made by the underwriter, please see our underwriting overviewUnderwritingIn investment banking, underwriting is the process where a bank raises capital for a client (corporation, institution, or government) from investors in the form of equity or debt securities. This article aims to provide readers with a better understanding of the capital raising or underwriting process. During the second phase of underwriting advisory services, investment bankersList of Top Investment BanksList of the top 100 investment banks in the world sorted alphabetically. Top investment banks on the list are Goldman Sachs, Morgan Stanley, BAML, JP Morgan, Blackstone, Rothschild, Scotiabank, RBC, UBS, Wells Fargo, Deutsche Bank, Citi, Macquarie, HSBC, ICBC, Credit Suisse, Bank of America Merril Lynch must estimate the expected investor demand. This includes an evaluation of current market conditionsSystematic RiskSystematic risk is that part of the total risk that is caused by factors beyond the control of a specific company or individual. Systematic risk is caused by factors that are external to the organization. All investments or securities are subject to systematic risk and therefore, it is a non-diversifiable risk., investor appetite and experience, news flow, and benchmark offeringsStock Investment StrategiesStock investment strategies pertain to the different types of stock investing. These strategies are namely value, growth and index investing. The strategy an investor chooses is affected by a number of factors, such as the investor’s financial situation, investing goals, and risk tolerance.. Based on all these conditions, investment bankers or underwriters will draft a prospectus with a price range that they believe is reflective of expected investor demand. Then, combined with institutional investors’ commitment, the underwriter will narrow the offering at a firmer price. 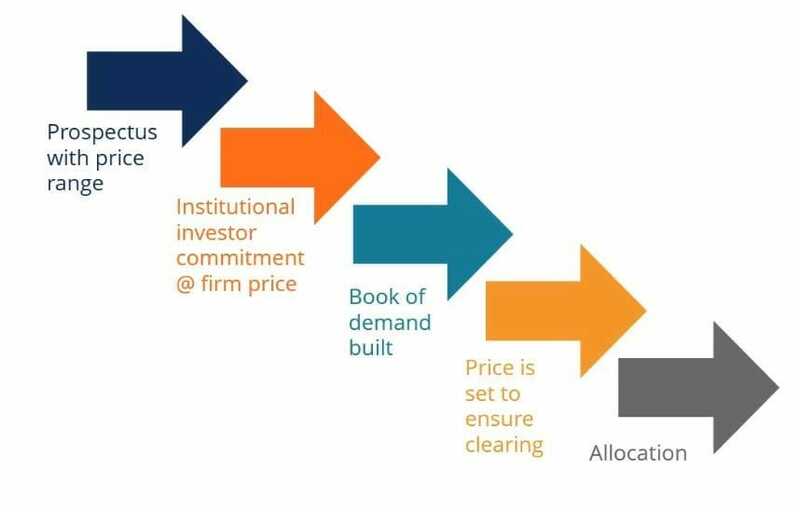 As investment bankers receive orders at certain prices from institutional investors, they create a list of the orders, called the book of demand. From this list, investment bankers will justify and set a clearing price to ensure the entire offering is sold. Finally, the allocation of stocks or bonds will occur based on the subscription of the offering. In the case of an oversubscribed book, some investors may not receive the full requested order. The roadshow is often included as a part of the capital raising process. This is when the management goes on the road with investment bankers to meet its institutional investors who are going to be investing in their company. The roadshow is a great opportunity for management to convince investors of the strength of their business case during the capital raising process. Investors are adamant that management structure and governance must be conducive in order to create profitable returns. For a successful roadshow, management must convey efficient oversight controls that exhibit streamlined business procedures and good governance. Although risks aren’t positive, management must highlight and be upfront about the risks involved. Failure to report any key risks will only portray their inability to identify risks, hence demonstrating bad management. However, instead of spending the majority of their time identifying the risks, management should emphasize their hedging and risk management controls in place to address and mitigate the risks involved in carrying out their business. Informing investors about the management’s tactical and strategic plans is crucial for investors to understand the company’s future growth and trajectory. Will management be able to create sustainable growth? What are the growth strategies? Are they aggressive or conservative? Again, although competition isn’t a positive factor, management must clearly address the issue with its investors. When discussing key competitors, management should lead the conversation to how their competitive advantage is, or will be, more superior than that of their competitors. Why does the management need more cash? In what projects will these investments be used for? Investors want to not only understand this company, but also the industry. Is it an emerging market? What is this company’s projected growth compared to the industry growth? Are the barriers to entry high/low? Even though investment bankers devote substantial amounts of thought and time in pricing the issue, it is extremely challenging to predict the “right” price. Here are some key issues to consider in pricing. After the offering is completed, investors do not want a lot of volatility. High levels of volatility will represent that the security was valued incorrectly or unreflective of the market’s demand or intrinsic value. If there is to be any price volatility after the issue, hopefully, it will be to the upside. A strong post-issue performance will indicate an underpriced offering. If an offering attracts only a few highly concentrated investors, the probability of price volatility will be high. The deeper the investor base, the larger the investor pool, will lead to more stable prices. 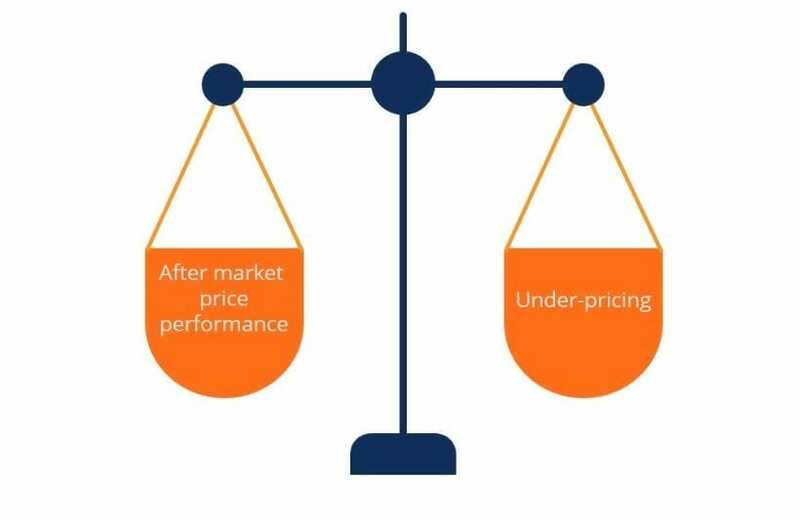 Choosing the “right” price requires a tradeoff between achieving a strong aftermarket price performance and underpricing. Therefore, an investment banker should price the offering just low enough for a strong aftermarket performance, but not so low that the issuer feels the offering is undervalued. Underpricing an issue reduces the risk of an equity overhang and ensures a buoyant aftermarket. Then why wouldn’t underwriters want to underprice every time? In short, underpricing an offering is simply a transfer of surplus from the issuer to investors. The issuer will incur an opportunity cost of selling lower than its value, while investors will gain from buying an undervalued offering. As banks are hired by the issuers, the underwriters must in good faith make the best decisions and returns for the issuer by correctly balancing the tradeoff. In order to price an IPO, banks must first determine the full value of the company. Valuation is done by a combination of Discounted Cash Flow (DCF), comparable companies, and precedent transactions analysis. For more information on business valuation and financial modeling, please see our financial modeling guideWhat is Financial ModelingFinancial modeling is performed in Excel to forecast a company's financial performance. Overview of what is financial modeling, how & why to build a model. A 3 statement model links income statement, balance sheet, and cash flow statement. More advanced types of financial models are built for valuation, plannnig, and and financial modeling course. Once investment bankers determine the full value of the business through these financial models, they deduct an IPO discount. 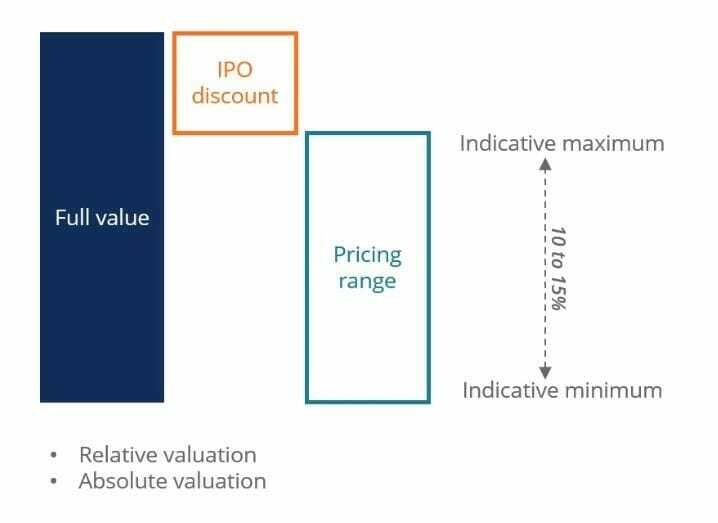 Hence, in IPOs, there is usually a discount on the intrinsic or full value of the business to price the offering. The full value minus the IPO discount gives a price range that investment bankers believe will attract institutional investors. Typically, 10%-15% is a normal range for the indicative minimum and maximum prices. However, exceptions always exist. In the case of a heavily oversubscribed offering, the excess demand may offset the IPO discount, exceeding the price range. On the other hand, if the demand is lower than expected, it may be re-priced below the range.